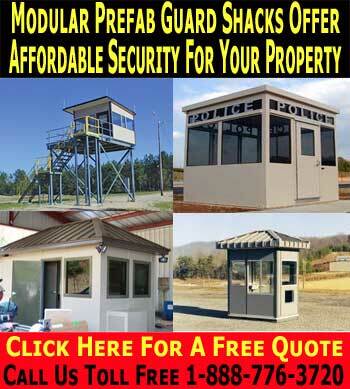 Prefabricated & Portable Security Guards Shacks. Maintaining the security of your business premises and keeping them safe from potential thieves requires a range of protective measures to be taken. Fences around the perimeter of the property, alarm systems and close circuit television cameras can all be installed as a deterrent, but the best way of protecting your business from crime is to employ onsite security guards. Shacks are available to be sited around the premises to provide a place where the guards can coordinate their patrols, and rest in between checking the site. Depending on the levels of security your business demands, there are a wide variety of different security guard shacks and booths available. You can choose from different thicknesses of the aluminum that is used for the actual construction from one and three quarter inch through to a full three inches if the demands of the booth require that. As with all the different modular buildings that we offer, our security guards shacks are built to the highest standards of construction, and can be shipped to you either fully constructed for instant use, or knocked down in kit form to be constructed on site. The actual facilities in the booths can be specified by you when you order, and a comprehensive range of equipment is available to ensure that the system you get fully meets your needs. Whether you need a booth for a security guard to use when admitting people in to your premises through the main gates, or to act as a place for coordinating all of the operations, there is a custom solution available from Easy Rack. From one man security shelters to stand at the entrance to your office through to large multi purpose modular security guard shacks that can be used for monitoring large areas via integrated TV systems, there is a shelter for every need available. Thanks to the modular nature of the security shacks available, you will be able to customize every aspect of the design to your precise needs. From the size and layout of the booth through to the exterior and interior paint job, the whole thing can be tailored to fit in with the rest of your premises, and then shipped to your location ready to install and use. The main requirements of a security guard shack are that the building is able to protect the occupant, and allow them a great deal of access to the surrounding area. The booth needs to have windows on all sides if possible, feature a means of communication with the rest of the premises, and be located in an area with good visibility. A well placed security booth can act as a deterrent to would be criminals, and thanks to the fact that a guard is able to make complex decisions and take action as well as just observing the site; he offers a much better level of protection than cameras and an alarm system alone. Whatever the needs of your business, security needs to be considered a major priority, and providing proper protection and shelter to guards will assist them greatly in getting their sometimes difficult job done properly. Guard Booths, Gate Houses, Toll Booths, Equipment Enclosures, Smoking Shelters, Observation Towers, Press Boxes, Ticket Booths, Parking Booths and Gas Station Booths. Easy Rack carries a wide variety of commercial shelving, material handling equipment, commercial lighting, used pallet racks, and modular prefab buildings installed nationwide. If you can not find what you are looking for call us toll free at 1-888-776-3720 and we will find it for you. Our home office is located in Houston, Texas with warehouses located throughout the United States that enable us to service all 50 states including New York NY, Los Angeles CA, Miami, FL. Chicago, IL. 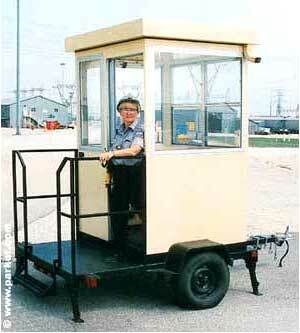 Denver CO., El Paso, Texas, Dallas TX, San Antonio, TX, Austin, TX, Boise ID, Atlanta GA.
Security Guard Houses. Depending on the level of security required and also the specific needs that you have for your business in setting up the protection for your premises, there are a number of different security guard houses to choose from. An access control security booth & Portable Ticket Shacks are often the first tangible sight of a business that people have, so it is important that the booth is smart, modern, clean, and that it presents the company image or color scheme. 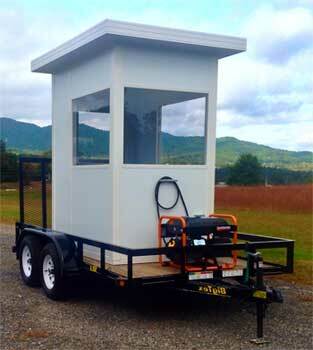 Guard Booths, Shacks & Security Towers. By implementing a comprehensive security strategy that involves all the different aspects of looking after your premises and business, you can create a much lower risk that your business could become a statistic. Prefabricated Bullet Proof Buildings. The main area where a bullet proof building is required is at the primary access point to a site. The main gate security building is the key point in the ring of steel that protects your business.